One of my good friends once confessed she thought of me as a cat who always lands on her feet no matter what unimaginable hardship is thrown my way. I find that very peculiar since I would not classify myself as a cat lover, but have had two pet cats- one was an ill thought out gift from a high school boyfriend and the other was "inherited" from Doc H's ex-girlfriend. While both cats lived long lives, I am cat-free at the moment. In 2018, I find myself a forty-something mother and step-mother to two college students, a recent college graduate, and a young, college-educated adult finding her way in the world. I am a second wife and Doc H is a second husband. We have no "ours" except for our dog. Our family has blended together better than I ever could have imagined or dreamed. Don't get me wrong, we have had to work our way through family issues in the past, but we've managed to weather those storms and we have achieved a close-knit family we are both very proud of. We are very fortunate. Despite the fact that we have begun the empty nesting process and now all our kids, except one, have flown the coop, our schedule is still just as messy as ever. We have been together for over fifteen years now, and I can't tell you how much I enjoy being married to this man! After a year of college I married my first husband and subsequently only finished my second year of college. After a nine year academic hiatus, I found myself finishing my degree as a penniless single mother. I thank God for all my supportive professors who were willing to take my toddler-daughter out for walks while I took tests, or allowed me to bring her to class and were willing to overlook the crayon marks she left on the desks. Doc H came into my life in an amazing fashion. I'll have to write that story one day. When Doc H and I began our relationship, I think it's fair to say we were both struggling financially. Everyone thinks doctors make a TON of money. Well, here's the truth...medical residents don't even make peanuts for the hours they work. Fellows a little more, and attendings start their careers working hard to payoff the bottomless crevasse of med school debt they accumulated in pursuit of helping others. We were able to pay off our own college debt... Just in time to pay for our oldest's freshman year! Hey now! Isn't life just great! I bring this up to reassure everyone that we know what it's like to live on a dime. Neither of us came from wealthy families. I understand what it's like to work hard, budget, and I have even robbed Peter to pay Paul (quite a few times!). Once you've lived it, that life experience is with you forever. I began blogging because I finally have the time and have decided to make it a priority. After consistently having a job since the age of fourteen, I packed up my office Fall 2011, looked out my office window last time and headed home to take off the suit. Identity crisis ensued, but writing and blogging definitely spurred my self-reinvention. "Your Doctor's Wife" came into being after hearing numerous complaints from friends and acquaintances about their doctors and the current medical system. 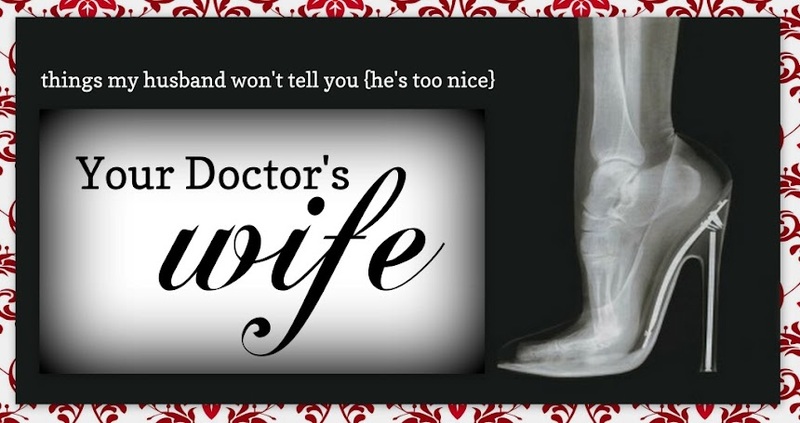 As soon as people learn you are the wife of a doctor, it is open season for such conversation. It is even worse for my poor husband. On top of doctor complaints, rants on our medical system, and co-pays, he listens to a list of ailments....from strangers even! Hearing such chatter bothers me more than him, I'm sure. I can only take so much blood and guts talk. Mr. Stranger, please don't tell me about your prostrate or how you need a Viagra prescription, after all, I am just... Your Doctor's Wife. Found you through the bog hop! I'm a new follower! Hope you'll follow back! Um don't you know you have an MD by association? Or at least I like to think so. Love the blog! You certainly have a knack for weaving words together. I am still giggling over here!!! You have such a great blog, I look forward to more of your posts! I am a fellow doctors wife (and veterinarian). I can relate to the misconception about how lucrative medicine is. We're pushing 40 with not a single asset. He's got a few weeks of fellowship left and we are definitely robbing Peter to pay Paul. Neither of us come from wealthy families and we are completely on our own financially. Add to it the endless comments about how doctors are assholes and they don't listen and they're so stupid...if people only knew. Like you, I feel way more defensive about it than he does. I look forward to exploring your blog. I came across your blog from the Never Growing Old site. You definitely have a knack for writing. I loved reading your bio and can relate to going back to school as I too am a non-traditional student. Just wanted to say Hi and that I look forward to following your blog. Hi Emma, good to meet you, I really enjoyed reading your post, I was just on another talking about my empty nest, seems my son that has been working part time for us decided to fly the coop and go back to Utah to create his own business and after 5 years I am really sad right now, he was so helpful and I just love him so much!! I know he will be back occasionally but right now he is missed! I am a new follower today, as a result of your stopping by Oh! My Heartsie this past week to join us in the #StackYourStats linky, hope that you can do it again. Found you through the Blog Hop! As a medical assistant, even I have to listen to ailments and the assorted "what do you think this is?" It annoys me to no end. My family is the worst! This is great! Love your intro! I thought of my mother in law who is a Dr. wife of 20+years now and my husband is a new Doctor of Physical Therapy which somehow makes everyone think he knows the cure to their aches and pains. It is quite interesting! I'm here from SITS. Would love for you to follow my blog although it's quite different in nature. Wishing you the best! Love it! Especially the photo of the in the header. Ha! What a fun blog! I found you via the working wednesday blog hop. I love that you packed up and decided to follow your dreams and take your life in a different direction! Just found your blog and loving it! I can relate to so many of your posts!! Hi! I just found your blog and i'm already looking forward to read more! I've been reading through e-mail for a while and I just wanted to say I thoroughly enjoy your posts. Just came over from UBP13 - great post! Looking forward to read more as soon as I have a minute and sit down on my couch to read (so that might be in 2016 or so). I am a UBP participant and glad to find you. Very interesting story and I can empathize with your story. Although I am not a medical professional, I work in a hospital and get an ear-ful about the costs of hospital care when I mention where I work. I am a CPA also which automatically has people assume I am a tax expert, which I'm not. Going to follow your blog via Bloglovin! Always love stopping by and reading some of your posts. I stopped by for the UBParty! It would definitely not be described as a undesirable strategy to perform via your essay or dissertation via great sentence structure software package to pin level undetectable errors throughout sentence structure that you might definitely not essays help onlinemanage to distinguish via basic reading. I found this blog years ago when I was a little wide eyed pre-med and now I'm a poor (resident) doctor's wife myself, finishing school. So glad to see there's a recent post, knowing you're still active makes me smile.